Freestanding bathtubs and marble surfaces certainly glam up hotel guest rooms, but for most down-to-earth travelers, such perks aren’t necessities. 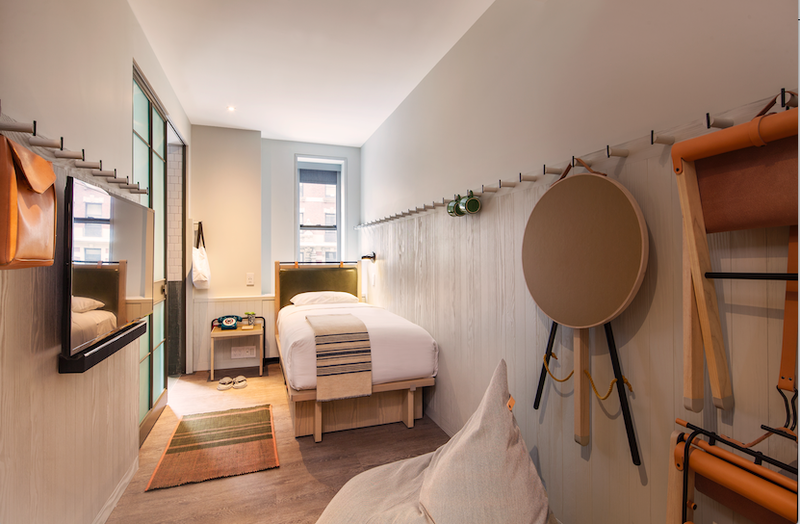 Given how little time is usually devoted to holing up in these spaces, it only makes sense that over the last decade the no-frills micro-hotel is on the rise — particularly in Asia and real estate-cramped New York City. Tiny rooms stripped down to the coffeemaker– and refrigerator-free essentials translate to gentler rates — leaving more cash for, say, cultural and culinary excursions. Whether flaunting a lively rooftop deck or a basic bed hidden behind a bookcase, these 10 brands prove that style need not be sacrificed for size. 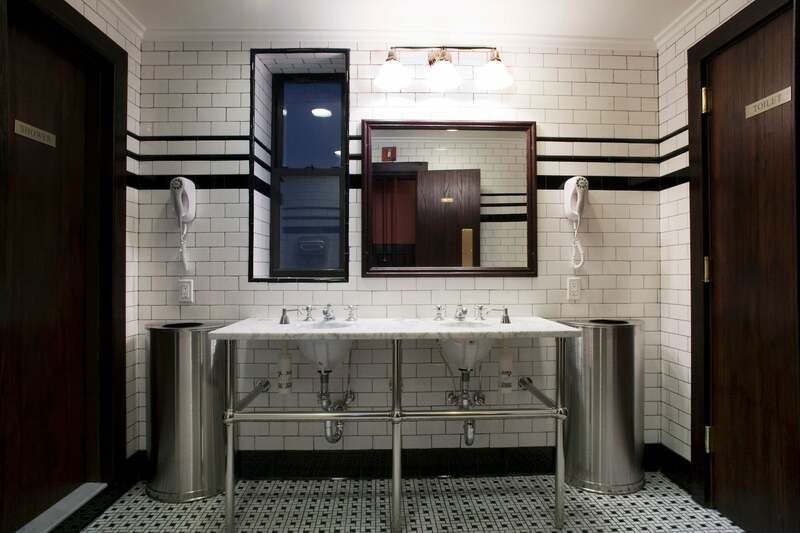 Pioneering NYC hoteliers Richard Born and Ira Drukier, known for buzzy boutique properties like the Mercer and the Bowery, launched the capsule concept to New Yorkers back in 2007 with Pod 51 in Midtown East. Pod 39 in Murray Hill followed and then came a location in the Penn Quarter of Washington, DC. Capturing the cool kids’ vibe permeating the Williamsburg neighborhood, the recently opened Pod Brooklyn is decked out with a sky-lit lobby, courtyards and rooftop lairs. The modular guest rooms, built in Poland and shipped stateside, are maximized through features like clever storage contraptions and big windows that look onto greenery. Elevator shafts are dressed in murals at the Pod Times Square, the company’s new flagship venture with over 600 rooms averaging 115 square-feet — all with rain showers in private baths — as well as Pod Pads. These extended-stay suites are for those who yearn to make the place — and its forthcoming tiki bar — home for just a little longer. Most guests spend time in their hotel rooms sleeping, showering and getting dressed. 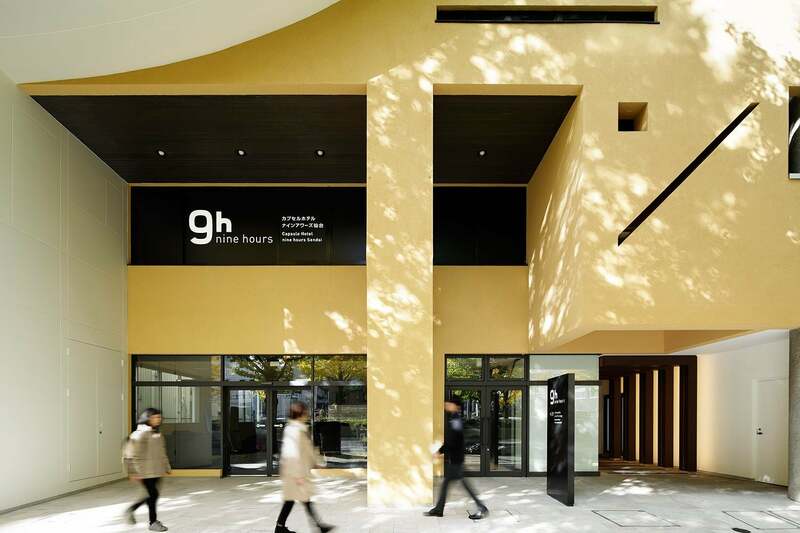 Japanese brand Nine Hours, which has a presence in Kyoto and throughout Tokyo, is a reference to this trifecta of mundane activities and the amount of time it likely takes for all of them combined. But for those who can’t escape work during their daily routine, a seat at the long wooden table at the Shinjuku-North locale, for instance, serves as an animated, communal workstation. Check into your clean, bright capsule, straight out of a sci-fi flick, at whatever time you desire. Powerhouse design firm AvroKo ensured that both the SoHo and NoMad outposts of Arlo in New York, despite diminutive guest rooms of some 150 square-feet, are inviting. There are different layouts, many with furnished terraces or courtyard views and custom furniture includes space-saving fold-down desks. 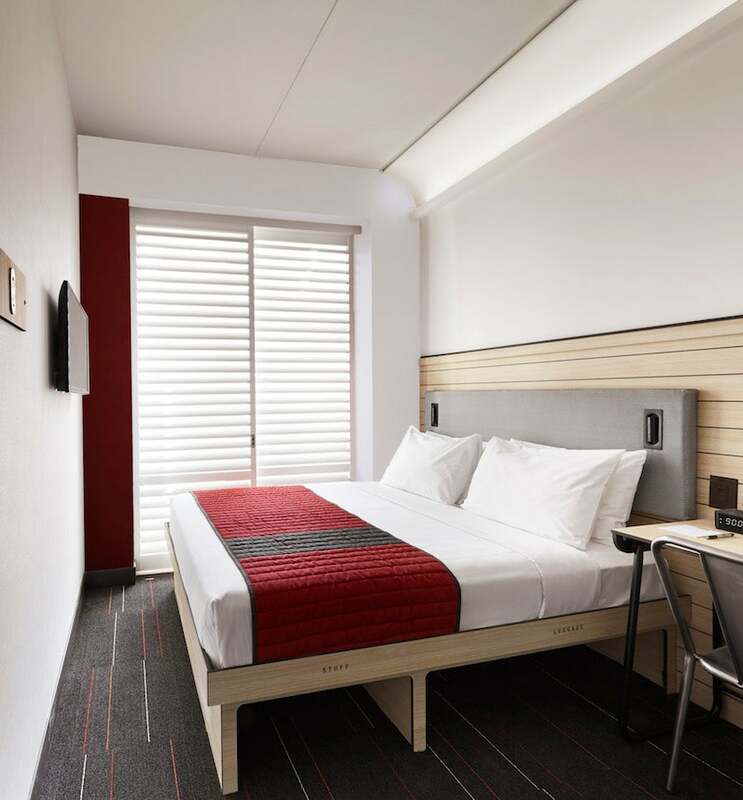 Sculptural, wraparound beds located near the oversized windows are the highlights, but what make Arlo Hotels particularly inviting are the homey yet lively public spaces. There’s no need to rush back to a room for the night when there are cocktails to savor amid concrete and walnut at Barlo in NoMad, or board games and vinyl records to play with at the Library in Soho. Moxy Hotels, Marriott’s upbeat lifestyle brand catering to happy-go-lucky Millennials, is not a pod-driven concept. 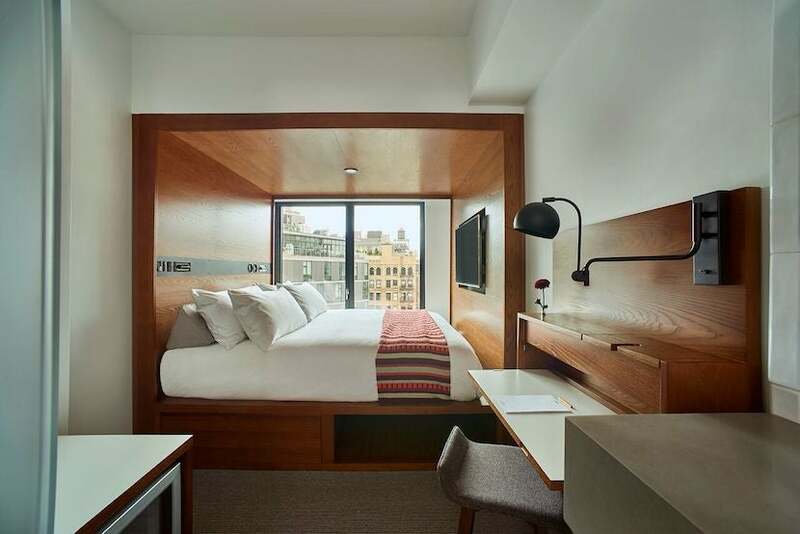 However, Moxy NYC Times Square offers 19 under-the-radar Crashpad rooms outfitted with light wood, flat-screen televisions and space-efficient wall pegs instead of closets designed by the esteemed studio Yabu Pushelberg. All of 110 square-feet each, the Crashpads can only be reserved via the menu at the amusement park-like indoor/outdoor rooftop bar Magic Hour. How delightful to collapse after one putt-putt round too many in a $99 retreat just downstairs. 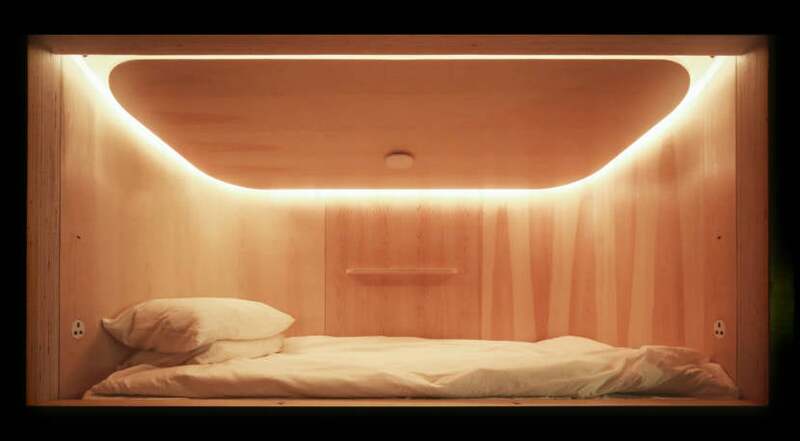 Consider Book and Bed, located in Tokyo and Kyoto. 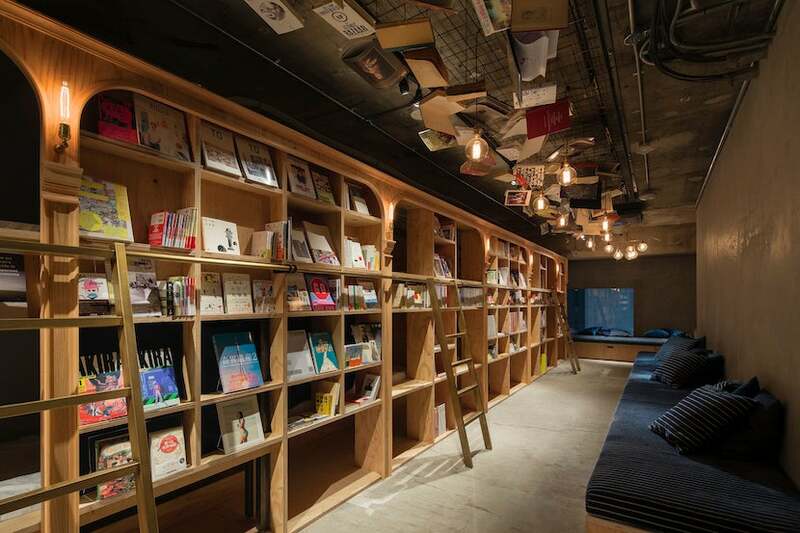 These primarily petite bookstores are lined with tomes from Shibuya Publishing & Booksellers. Then, when your eyes get heavy from the abundance of words, simply rise from the comfy sofa and make your way to one of the intimate compartments tucked behind the bookshelf housing a standard or compact bed. A bibliophile’s dream, it’s yours for the night. Whistler, the British Columbia ski and snowboard haven, is synonymous with luxe resorts and chalets. This year’s arrival of the Pangea Pod — the first of its kind in Canada — is a funky alternative then. Exuding the contagious social energy of a hostel through dynamic public spaces like a rooftop bar, it will be balanced by a reverence for privacy. All of the pods are graced by double beds and are surrounded by walls on three sides; entry is via a curtain drawn at the guest’s discretion. Smack in the village, minutes from the Whistler Blackcomb Gondolas, it has a prime location that would demand hefty rates at traditional accommodations. Despite its name, the First Class cabin isn’t the only room type at Japanese brand’s First Cabin, but it’s certainly the most commodious. Business Class and Premium Economy are also up for grabs at these airplane-themed properties in Kyoto, Aichi, Osaka and Tokyo; in some facilities, Premium with private baths, desks and comfy duvets are the ritziest of options. Grab ramen from the vending machine and then, just as if you are mid-flight, watch a movie until it’s time to shut off the lights; all sleek cabins have LCD TVs. Sailors once resided in the early 20th-century building in New York’s West Village that is now the Jane, famous for its photo shoot-ready Jane Ballroom on the mezzanine level. 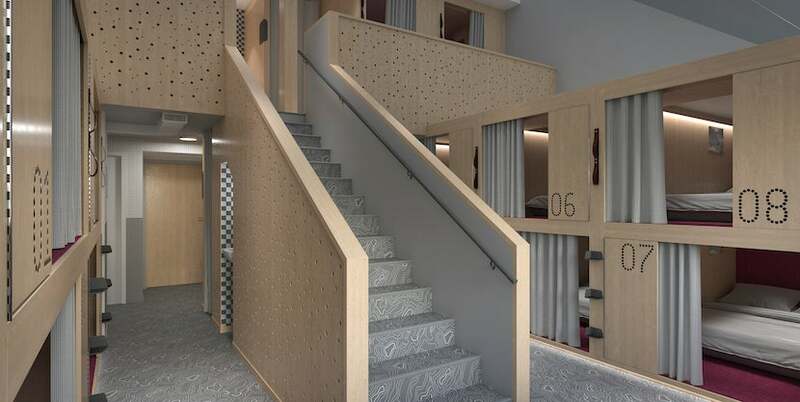 As a nod to this nautical past, the 200 cabins — most of which are standard and bunk bed configurations at just around 50 square-feet — are designed to resemble luxe ship staterooms. If this set-up is just a tad too wee, splurge on one of the Captain’s Cabins with a private terrace. Here, communal baths are shunned for private en suite ones stocked with toiletries from the neighborhood’s favorite apothecary, C.O. Bigelow. An affordable respite from bustling, pricey Hong Kong, Sleeep, right on Queens Road Central, is the creation of spatial product developer Space is Ltd. Inside these eco-friendly capsules pairing metal and wood, there is 100% LED lighting and fluffy, organic cotton towels. Before settling in for the night — or hour if a post-dim sum break is in order — guests are treated to a rare jolt of luxury for the category: The power to select their preferred pillow type, mattress firmness and blanket thickness. Swank, first-class airline cabins inspired the design of tech-forward YOTEL, where guests sleep on bespoke SmartBeds and refresh in monsoon rain showers at locations in New York, Boston, Singapore and soon, San Francisco. An even more convenient spin-off of the brand is the smartly designed YOTELAIR found at airports: Amsterdam Schiphol, Paris Charles de Gaulle, London Gatwick and London Heathrow. Use layovers to refresh in a bunk-style standard, sleep the night through in a premium-room bed that easily converts from a sofa, or just head for one of the shower-only zones. With mood lighting, pull-out work stations and round-the-clock gratis hot beverages, it’s easy to wish for a flight delay. A reminder when booking hotels: Be sure to use a credit card that earns extra rewards for travel or hotel stays. Check out the TPG list of The Best Hotel Credit Cards for some of the top choices.